Google made a big fuss about the Home Max when it announced it in October, but it didn't launch the speaker then and promised it would be available in December. Well, December is almost halfway through and we're starting to see the Home Max pop up on a couple of stores. 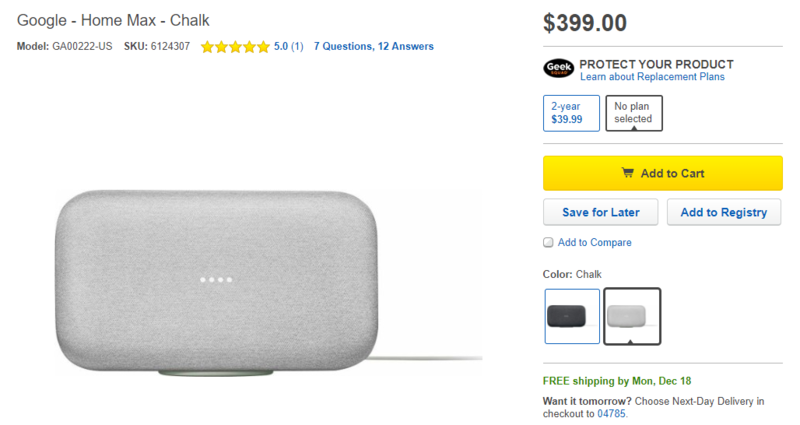 If you want the badass Google Home Max, your options now are Best Buy (chalk and charcoal) and Verizon (chalk only, charcoal is out of stock). Both let you add it to your cart and check out, with Best Buy offering free delivery by Monday December 18 or pick up in store around Wednesday 20 depending on your nearest store. The Google Store still says "join waitlist," B&H has "notify when available," Newegg and Walmart don't seem to have it listed, and Abt says it's an authorized dealer and can't sell it to you online but you can call and see if it's available in store. The price, as previously announced is $399. For that you get what is promised to be one of the best sounding speakers with dual 4.5" woofers and custom 0.7" tweeters that should give it 20x the power of a regular Google Home. (Oh boy!) The Max has Assistant and Chromecast built-in, Bluetooth, and 3.5mm input, and you can place it horizontally or vertically. If you're interested, check the links above or below. Google just published a blog post announcing the availability of the Home Max. So if you're unfamiliar with it or you just like reading marketing copy, feel free to go check it out in more detail. It's also up for grabs at a few more retailers. Walmart has it in stock, and the Google Store isn't being left out, either. You can pick one up at either right now for the same $399 price as other retailers. It's available in any color you want, so long as it's "Chalk" or "Charcoal."